As he prepares for a second summit with North Korean leader Kim Jong-Un, U.S. President Donald Trump is hitting back at critics who claim there has been little progress made from the first summit’s stated goal of the North’s denuclearization. “This is more than has ever been accomplished with North Korea, and the Fake News knows it. I expect another good meeting soon, much potential!,” Trump said. 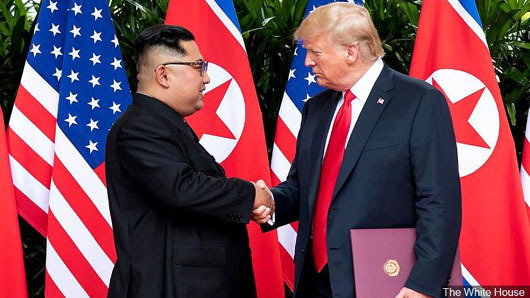 However Bruce Klingner of the conservative Heritage Foundation has argued that no progress on denuclearization has been made since Trump and Kim met in Singapore last June. “It’s not so much that the process has been derailed, it simply never left the station,” Klingner said. Klingner, who from 1996 to 2001 was the CIA’s deputy division chief for Korea, said Trump made three major mistakes in Singapore: accepting a poorly-crafted summit statement that was weaker than predecessor agreements, unilaterally canceling allied military exercises (at least nine have been canceled to date), and warmly praising Kim, who is on the U.S. sanctions lists for human rights violations. The 38 North think tank, which focuses one North Korea, has released a new white paper on what it calls a “pragmatic approach to nuclear safeguards and verification.” The think tank concludes that Kim Jong-Un must be convinced he doesn’t need his nukes to hold on to power. “Realistically, the DPRK will seek to retain what it regards as an effective nuclear deterrent until it is convinced it no longer needs nuclear weapons to ensure its survival and the survival of the regime – and until it is convinced that the risks involved with having nuclear weapons, and the political, economic and opportunity costs, exceed the perceived benefit. Accordingly, progress on denuclearization and associated verification will depend on progress on broader issues, especially the development of a peace process and a sustainable relationship with the United States,” 38 North said.